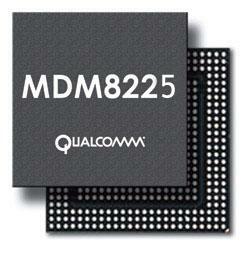 Today, at Mobile World Congress (MWC), Qualcomm announced a new mobile chipset, the MDM8225. The MDM8225 brings full support for HSPA+ Release 9 aka HSPA+ 84Mbps. If you may recall, T-Mobile had plans for HSPA+ 84Mbps and even HSPA+ 168Mbps when they first rolled out their 4G campaign last November. The new chipset will use “dual-carrier” technology, which will utilize multiple frequencies at the same time. Since T-Mobile’s 3G/4G network operates using both 1700MHz or 2100Mhz frequencies, the new MDM8225 chipset will be able to operate on both of these frequencies simultaneously. In addition to 84Mbps downlink and 23Mbps uplink speeds, the new chipset will also feature Qualcomm’s interference cancellation and equalization (Q-ICE) receiver. This receiver will reduce interference and increase network capacity, reducing the amount of dropped calls and poor cellular reception. Qualcomm states that samples of the MDM8225 are anticipated to be available in Q4 2011 with the first devices expected to roll out sometime in 2012. Check out the press release below, and don’t forget to leave your thoughts in the comments! BARCELONA, SPAIN – February 14, 2011 – Qualcomm Incorporated (NASDAQ: QCOM) today introduced its newest Mobile Data Modem™ (MDM™) chipset for use in mobile broadband data devices, the MDM8225™. This new MDM will support HSPA+ Release 9, the latest version of the popular mobile broadband standard, which incorporates technology enhancements that help the chipset deliver data rates of up to 84 Mbps on the downlink. The MDM8225 will be fabricated using the 28nm technology node. The MDM8225 chipset will support all major 3GPP radio bands, including the 1800 MHz band. As operators plan to refarm their 1800 MHz spectrum to provide for additional data capacity, the MDM8225 will add to Qualcomm’s family chipsets that will support HSPA+ in the 1800 MHz band. Except for the historical information contained herein, this news release contains forward-looking statements that are subject to risks and uncertainties, including the Company’s ability to successfully design and have manufactured significant quantities of MSM8225 on a timely and profitable basis, the extent and speed to which HSPA+ Release 9 is deployed, change in economic conditions of the various markets the Company serves, as well as the other risks detailed from time to time in the Company’s SEC reports, including the report on Form 10-K for the year ended September 26, 2010, and most recent Form 10-Q. please put this in the HTC Pyramid k? k.
y expand coverage when the chips used in the phone increase cell reception good job tmo let the manufacturers solve your coverage problem. tmo umts wcdma uses both 1700 AND 2100 at the same time. what DC (dual-cell) allows is the use of two 5-10mhz channels at the same time, within the respective bands. Just for clarification, the AWS band specifies the downlink (tower to phone) is on the 2100 band. Uplink (phone to tower) is 1700. Holy Cow yuss!! Rolling out speeds just as they originally planned. : ) glad to see they’re right on schedule. Move over Verizon and AT&T, T-Mobile isn’t messing around! That could probably double as new age electric warming underwear when it’s in your pocket. Not to be a Debbie-Downer again but these potential speeds are nice and all but it would be nice to have a diversified line-up of phones that can use these speeds. I’m tired of all the good phones going to the competition. (AT&T and Verizon.) Here’s hoping that the rumored HTC Pyramid will be one of the 1st super phones to come to Magenta. You actually chose to be a “Debbie-Downer”, if that is the only thing you can gather to comment on with such great news. And for the record tmobile had just a diverse line of phones as the other carriers. And they have been very methodical to carry phones that actually utilizes their current technology. We have 5 Phones that work on our HSPA+ network and ATT has one. How can you even compare. well how can i even compare? well lets see at&t has waaaaaaaaaaaaY more coverage than t-mobile ..
i agree with danny boy t-mobile needs to expand there coverage before they get coo phones . whats the use of havin 5 hspa+ devices if once u go out to rural areas u get no service while at&t and verizon have service..
ATT 4G service is not even officially up yet though and won’t be until sometime next month. Can you surf and talk on T Mobile now? Real question, not being sarcastic. Does any T Mobile phone allow this? one of the inherent benefits of being a GSM network. Not true. I have the original MT3G and surf and talk (simultaneously) all the time. Been doing for over two years now. From the time I bought my g1 phone until now on the mt4g. On 3G and HSPA+, yes. On EDGE and GPRS, no. Heck, you could surf & talk on the old Sidekicks. I don’t know why AT&T has those commercials making it sound like they’re the ONLY network that supports simultaneous voice/data. It’s simply not true, and hasn’t been true for years. I can see the new T-Mobile G3 having being the world’s first “5G” ™ phone and sporting this chipset. So now you are talking about a real world average of 30-40 mbps. Awesome!!!! Faster then my home internet which only averages about 11mb. who needs over priced Verizon and their LTE…T-Mobile will always be faster because Verizon will never open up the speeds that they are capable of…Long Live T-Mobile! meanwhile, only 1% will be lucky to use that speed… and most likely only at the renton, wa headquarters… sad thing is… im about an hour away from renton, wa and im still on E! wtf tmo? Yeah… that’s nice but can I get at least some real 3G speeds in Minneapolis suburbs? Not middle of nowhere neither, I’m only 8 miles away form Downtown, in the middle of everything and I still get less then 2mb down/1mb up. Phone shows me being connected to hspa+ network too, not 3g or edge. Got 5mb down once few months ago, never saw it again. Authoritatively say that currently-debuting technology is outdated because something better MIGHT come out ten months from now. You disregard, of course, that you don’t even know what the product is and that it’s a safe bet that no matter the product ten months from now there’s always something better hitting the market. Anyway, are you all ramped up about dual-core? Well, you can save your money. At MWC 2011 a few hours ago nvidia announced quad-core chipsets. Samples are in manufacturers hands and devices with quad-core are projected to show up in August-September 2011. Reportedly, competitors Qualcomm and Texas Instruments are not slated to debut quad-core until 2012, at the earliest. All I can say is holy cra… Even if the real world speeds are only 10% of that we will have some very fast internet. I have a my touch 4g I already get speeds over 12 mbps. I also have a galaxy 4g and I consistently see speeds ranging from 17 to 19 mbps. So gfam what you just said is completely incorrect. I live in Indianapolis, it’s not new york, chicago or dc.